Click on the Event Titles below to view the photos on our google web albums! 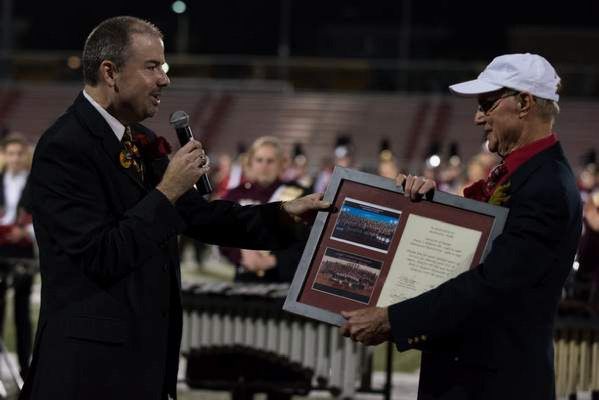 On October 7, 2017, Richard G. Wells was honored at the Owen J. Roberts Cavalcade Show of Bands for his years of service as a Music Educator. We are proud to introduce the beautiful, state-of-the-art Richard G. Wells Music Rehearsal Hall! Please check out the photos taken by Alyssa Peterson at the event. Progress on the Auditorium and Richard G. Wells Rehearsal Hall is happening very quickly these days. Check out where we are in the process now! Even though the weather was out of control for our Tailgate, we had a great turn out. Thanks to all who braved the storm to enjoy some great food and company! Check back often to watch the progress that is taking place with this renovation project! Groundbreaking has finally taken place on Schaeffer Auditorium! Thank you to all of the alumni and KUMU parents who helped to make this a wonderful time to socialize after a well done performance by the KUMU. Thanks to all alumni and KUMU members who joined us for the annual summer picnic on June 5th. Here are just a few pictures from the event! We had perfect weather this year for homecoming, no rain! Over 100 alumni and their families joined us throughout the day for homecoming this year. We started off the day with a field rehearsal with the KUMU, followed by a GOBS tailgating party behind the stadium. Alumni and their families then joined in the stands to support the Golden Bears. Halftime was a huge treat as the Alumni Band along with the KUMU performed music of the Beatles. The day concluded with a post game social, held in the Georgian Room, where we honored Richard G. Wells for all that he has done for the music programs at Kutztown University. Even though we had a rainy day, the 2010 GOBS Picnic was a great success. Alumni had the opportunity to meet and chat with current KUMU students who had just completed their Read Through Day session. Thanks to all of the GOBS who were able to make it! please contact the GOBs at kutztowngobs@gmail.com.